When their delicate tentacles wave in underwater currents, sea anemones may look like plants, but they are predatory animals in complex reef ecosystems. Use a saltwater mix from an aquarium store to create tank water for a sea anemone, and install live rock, a pump, a heater and filters to recreate reef conditions. Take care when handling your sea anemone -- some, such as the Hell’s fire anemone (Actinodendron sp. ), inflict painful stings. Sea anemones anchor themselves to substrates and wait to catch prey in their outstretched tentacles. 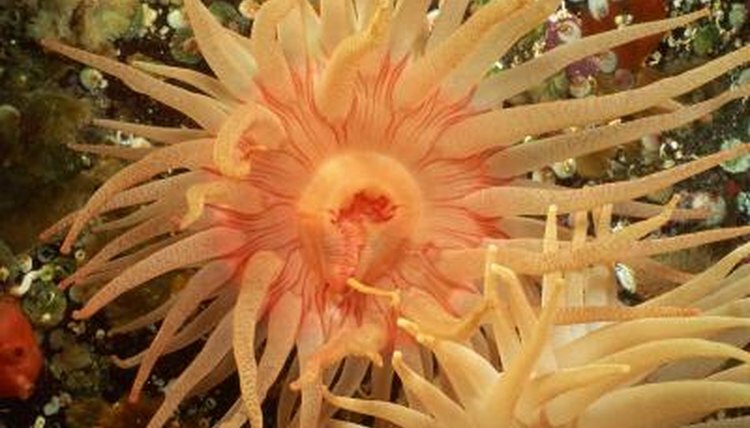 The type of substrate a sea anemone needs depends on its species. Some, such as the bulb tentacle sea anemone, prefer to attach themselves to hard surfaces, while others bury their bases in soft substrates like sand or mud. Actinodendron species need a layer of sand 6 inches deep. When first introduced to a tank, a sea anemone moves around until it finds a suitable surface, then settles there. Take care when moving sea anemones, as tearing their bases can kill them. Marine algae called zooxanthellae live within sea anemone tissues in a symbiotic relationship, converting light to food. Without adequate light levels, sea anemones don't get enough food from the algae in their tissues and can die. Install sufficient light bulbs to supply between 2 and 5 watts per gallon of water, preferably actinic light bulbs or metal halide lighting, which provide blue spectrum light. Zooxanthellae give sea anemones their color. One sign that light levels are too low is when anemones turn pale -- this means their zooxanthellae are dying. Turn aquarium lighting on for 12 to 14 hours a day. Tank conditions should mimic the warmth and movement of reef water for sea anemones to survive in captivity. Heaters supply the warmth some sea anemones require, but they can burn themselves on contact. Place the water heater in the aquarium sump or make a PVC cover for the heater, with slots cut into it. Fitting tanks with water pumps oxygenates the water and helps remove waste products from sea anemone tentacles, but the animals can also become entangled in the pumps and die. Fit a sponge filter over any open or moving parts, such as in the intake of a powerhead pump. Coral: Mini-Carpets: The Perfect Small Sea Anemones?